Setup fee is back even if promotion was until 28/02/2015 !! Totally UNFAIR ! I don't disagree with the fact that in my mind also OVH are a very good provider and the cost's are some of the lowest around as you can see I have been a loyal customer for quite a few years now and do not have any intention of leaving. My only issue is that the company made an offer on it's website to run until a certain date and did not stick to that date. You are right that OVH has for me a good customer service but they still have some improvements to make, when these offers are made and how these campaigns are deployed and run. As to the VAT changes there was quite a bit of advanced notice via the newsletter and some other information I had noticed. So this gave me time to inform my customers and the changes that I would need to make. As with any company things can always be improved for the customer and while I can not fault the technology deployment and improvements over the years and the low costs, they still have to be careful with announcements like special offers and alike. For me I managed to get the issue sorted with a few emails and some pure facts to argue my case and a calm head I guess but like any other business I also have to get the best price at the time for my customers and have to explain those increases or decreases in my pricing structure. Well i didn't really want to reply as you and i seem to agree fully on this matter but i just wanted to give you a thumbs up for your reply. Guy's i do not disagre with you but keep in mind that ovh, soyoustart and kimsufi offers a service that is by far cheaper than most and you are free to change provider. Also ovh IE has the nicest phone support i ever had from a hosting company (ive even worked as technical phone supporter for a major isp) and i take that as a big plus. mind me, i do steward alot of ovh servers and had to justify the new VAT rules to my costumers recently and now the setup fee that is back. ive had a few angry ppl call me but at the end of the day all of them is still ovh costumers. i can only conclude that even if people dont seem to happy with the changes ovh make they are still the best provider out there as is. Its an exception as you explained in your first email. Well quick result from this mornings support ticket, thanks to Neil. New order done with set up fee removed. Be aware that I am a UK based customer so I do not know if it is any different for anyone else. Not just one of you, all of you, so maby something will happen (nah, like something good can happen with this company). Tried twitter for Oles and OVH UK and they do not even answer the tweet. I did put in a support ticket and Danny told me to make an order and not pay for it and he would remove the set up fee and then I would pay after he had removed the set up fee but now that order has expired and the set up fee was never removed. So I have just emailed again to see what now happens. SYS and OVH need to deal with this. Unacceptable level of scamming. Even their GAME range, consistently changing the BETA dates, and small print that stops you from renewing. Who the hell runs a business like this? This is nothing new from ovh, unprofessional unfair terrible support, especially abuse department! their commercial documentation and/or brochure. Well I have just spoken to consumer protection (Trading Standards) about this and because the soyoustart.com legal documents state it is registered in London under OVH Limited they are still bound by the Consumer Protection from Unfair Trading Regulations 2008. So the lady I spoke to is going to be in contact with OVH, it is not good enough for them to just tell me it is head office choice if they remove a special offer or as Network has received in his/her email, they are still bound by those regulations. They have to be guided by those regulations as well when it comes to special offers and not misleading customers that an offer will be in-place for a set period of time and then just removing it without prior notice given. So we will see what she has to say to me when she calls me back. We had a promotion on that excluded setup fees. This only ran for a short time and is now over. REDSTATİON The time to switch! I think we are waiting in vain, setup fee to stroke. I moved out of a road close to the redstation. On the contrary I've run a speed test on the server and it can handle over 600mbps which is a lot better then sys and a little better then expected. 1gbit network with 200Mb bandwidth. I've gone here for a server as more choice an still going to move my other stuff off the ovh network before servers end this month. Setup fees still there. Shows up in the order preview page with the line item "Server preparation and set up". I have just spoken to UK support about this and he said the offer can be removed at any time. I did try to ask how can an offer be removed when there are no T&C's with that offer, IE: Once the stock is sold the offer can end before said date. As we all know there was nothing like that just a blanket statement that it would run to that date and no conditions from what I could see. He can not do anything from his end all I can do is email them stating what has happened and it will be passed on. A shambles if you ask me and not one person fro OVH has even made a post here to explain what is going on. It is head office that make the decision if an offer is removed. I'm sure OVH have some respect for their clients and setup fee removed on monday. There is no mention of no setup fee on this page? improved ticket system for information on ticket throwing setup fee. How many people are attracted so much attention throws. 3 days do not look even enter a subject in the forum. Obviously its not there now because they removed it, but it was there for almost a month, take a look at archive.org of that page 2 weeks back.. I can't believe OVH didn't take any action yet ! or facilities are available (whether generally or from particular persons). We were not able to ADD SPLA licenses to the servers. Like that this should be a bug. And i think the staff are either unaware of that or are just passing some replies to get more time. I am adding the last reply of this thread also in the screenshot and you can check the system date also , just to show that the screenshot is really taken at this time. Bottom line is to wait until Monday to give them a call, you will get a better response than what you get on weekends. huge OVH does not fit, infamy! I move that the removal of SYS team setup fee if Britain servers. yes ill agree but they are limited to 250mb connection and also they like to hold the setup fee the same even if you want it for 6 months no reduction there. Here is a place that have servers for £22.50 a month and on 1gbit connections and no setup fees. Just helping spread the pleasure to us here at no way ovh. on SYS prices are much better and 16 free IPs. Right ! Some people like me made some plans based on their promotion. For example my budget was setup to rent 3 servers within this time frame (until 28/02/2015), now I must double the budget !! If I knew the promotion will end sooner I would rent all servers in the first place. that they start early to avoid the setup fee because there is no stock of orders in hand according to the latest information. This is outrageous from such big company (OVH) to do something like that. I know small businesses can cheat people with fake marketing but I didn't expect it from OVH. I will be left speechless if they do not reinstate promotion offer until 28. Feb 2015 as stated on their website. Do you have tried to call the phone? I think the call without entering the weekend. still no reply off anyone, trying phone support / sales to see if anything can be done. 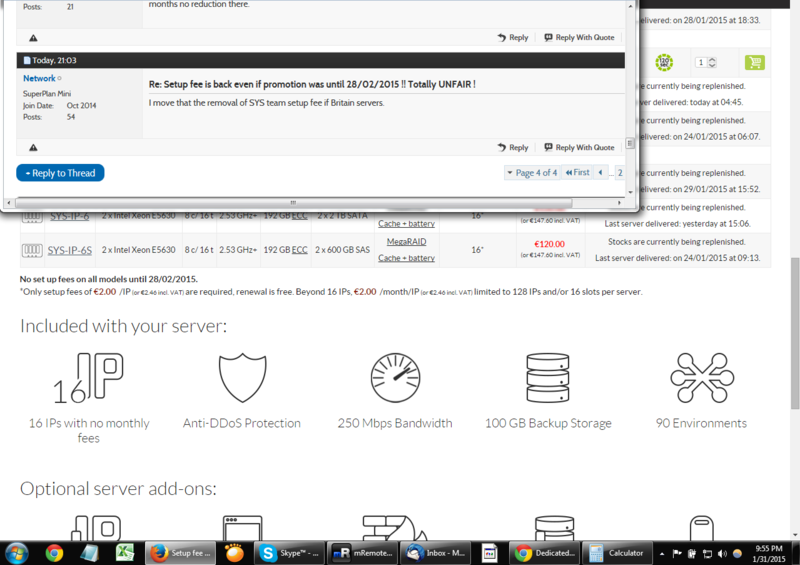 Yes, keep me in the same way is not going to cancel this month 6 serverice my England I'm getting the server. ive got two servers elsewhere an one on a kimsufi and was going to migrate all services into one new place and not have to login on three different servers. just wanted unbrella effect no remembering ports and complex passwords for each. thank you, please let us know developments. Is it possible for you to show me where this is? I am currently unable to locate the dates which you have mentioned. i have added a picture of your site and it still states there is not fee's for your servers as stated in my previous email im only after the sys-ip-1 which i could have ordered a week ago with free install on a month to month basis. This is the order i want on a month to month basis on no setup fees. could you correct this invoice for me to be able to pay for the server! Hello this is the third email regarding this matter to which I am still awaiting for a reply over the invoice that still has to have the install fee removed. I had sent you a copy of what your site stated at which point the site was updated within 20 mins of me sending the picture. Now I am still waiting for one reply off the others I have sent. It appears you may be viewing an older copy of the website. I have just checked the website and it no longer says that. i know you can say that now as i have made it publicly aware on the OVH Forums i have also uploaded the pictures that was from before and after the times of your email also i have made two copies of your website to which i feel the EU Marketing committee would also like to see as well as timestamped email logs which also show the website was changed at the same times as the emails were sent back and forth. all i am asking is for the fee's to be removed as server was on offer at the time i ordered and your website stated that the fees were free untill 28/2/15. i will also be uploading the conversation to OVH main web forum for all to see. either the fee's get removed or i will publish the emails and email the EU marketing commission in regards to false advertising Strategies being used. Current order page : " No set up fees on all models until 28/02/2015." It must be a software glitch, there is no setup fee till 28/02/2015, dont order now people..
And now you can not even spread the setup fee is even worse. After all these what is it with OVH and setup fees always been a bug that has annoyed me, adding them, taking them away, spreading the cost. Come on ovh... dont make your people suffer..
no ovh staff want to comment on the cheek of the sale and website team. still waiting for the email for access to pay the £30 for the server for the months hereby. Now that's cheeky of them .... I'm glad I got mine before they put that back on. I remember it saying 28/02/2015 as well. proof of the pudding lol below. it was on all as i had it loaded last week on a month to month basis as i dont want to commit to a full 12 month upfront. Setup fee is only being removed from order page if you sign up for 12 months, so nothing has changed as yet.if they were doing something on the page. there updating the site as i type this as its off most of the pages now! lets see how long it is before they get back over this one. ones asking me to show him and i have. ive also copied all of site to external server so they can not modify it and say it was not there as i have the whole site backed up elsewhere. yes sir.. everybody looking for an explanation from sys staff..
Have just noticed this myself was going to order a new server but will hold off now.